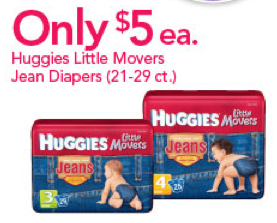 Babies R Us: Huggies Jean Diapers Just $3 Per Pack! Today and tomorrow (9/9/2011-9/10/2011) Babies R Us is having a great diaper sale. Huggies Jean Diapers are just $5 per pack and you can get them for just $3 per pack!